Capacity: 15,000 (1913); 11,000 (1938); 18,000 April 1969); 25,420 (June 1969). Viewpoint Tickets - Best prices on Mariners tickets, Brewers tickets, MLB tickets and MLB All Star tickets. Location: 1st base (W), 2700 Rainier Avenue South; right field (S), South McClellan Street; left field (E), Empire Way South (now Martin Luther King Jr. Way South); 3rd base (N), Bayview Street. Dimensions: Left field: 325 ft. (1938), 305 ft. (1969); power alleys: 345 ft. (1969); corners just right and left of center: 405 ft.(1969); center field: 400 ft. (1938), 402 ft. (1969); right field: 325 ft.(1938), 320 ft.; backstop: 54 ft.; foul territory: very small. Fences: Left field: 8 ft. (3 ft. concrete below 5 ft. wire); center field: 12.55 ft. (3 ft. concrete below 9.55 ft. wire); right field: 8 ft.(3 ft. concrete below 5 ft. wire). 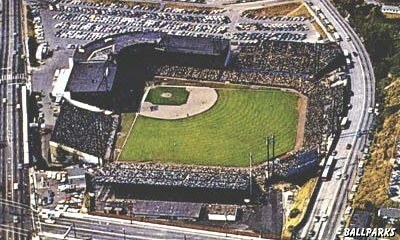 Sicks' Stadium, also known as Sicks' Seattle Stadium, opened in 1938 and was the second ballpark built on the site. Dugdale Park was built there in 1913 and housed the Seattle Indians (PCL). It completely burned down after a 4th of July celebration in 1932. The team played at Civic Field (located near where Key Arena is today) until the new ballpark was built. The Sicks' Stadium site is now home to a Lowe's Home Improvement Warehouse (formerly Eagle Hardware and Garden). There is a glass display case inside the store which shows some memorabilia from the Rainiers and Pilots. Named after Emil Sick, owner of the Rainier Brewing Company in Seattle, and owner of the Seattle Rainiers of the Pacific Coast League. Aerial view of Sicks' Stadium courtesy of the Franklin Digital Collection. Special thanks to Shonn Showlund and Keith Taylor for their contributions. Tickets to Milwaukee Brewers, NCAA Basketball Tournament, College Football Bowl, NCAA Football, Paul McCartney, Seattle Mariners and Wicked Seattle provided by Ticket Triangle.